Stretch marks (also referred to as striae) appear generally as a physiological effect of abdominal expansion and pregnancy related weight gain. These stretch marks usually begin to disappear after delivering the baby; however, in some cases the appearance usually exacerbates due to sudden shift in body weight. Irrespective of physiological factors, stretch marks are not specific to any age group or race; hence anyone can develop this cosmetic issue. In this article we will explore the million dollar question "do stretch marks go away" and what necessary measures one should take to avoid developing these marks in the first place. This question is really difficult to answer. With time stretch marks can gradually become really light, almost invisible. And according to the University of Maryland Medical Center, stretch marks may vanish completely if its causes are eliminated. Initially the marks appear as dark colored striations varying from red to brown and glossy in appearance. After some time, these marks fade gradually to become less visible within 6 to 12 months, but the texture of these scars will remain constant, similar to initial stages. It’s always better to prevent stretch marks from appearing in first place than worrying "do stretch marks go away" later. So try to avoid sudden weight loss or weight gain because stretch marks are a physical response to excessive stretching of tissues and moderate damage to skin fibers leading to scarring of the abdomen skin. The appearance of stretch marks can be attributed to constant contraction and then relaxation of the delicate tissue which results in the loss of flexibility. Besides, women who get pregnant are prone to stretch makes so try to take good care of yourself and have well-spaced pregnancies to reduce the chance of having stretch marks. 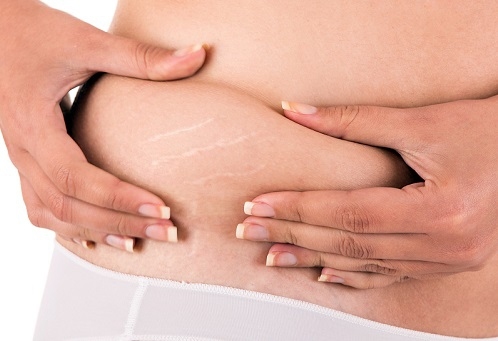 Sine we have known the answer to "do stretch marks go away", now let's learn how to get rid of these unwelcomed marks. Castor oil is widely used for treating various skin problems such as wrinkles, dark spots, pimples, fine lines and stretch marks. ● Place small amount of castor oil over your stretch marks. Gently massage the area by rotating the finger tips in circular motion. ● Wrap the area with cotton cloth or any thin cloth. Then apply controlled intensity of heat via heating source (such as heating pad) for a minimum of half hour. ● Repeat this process daily until the marks fade away. The constrictive properties of aloe Vera are used to treat various skin problems including stretch marks. ● Directly rub the aloe vera gel over the areas where stretch marks are present. Leave the gel on for 10 minutes then wash with water. ● Mix aloe vera gel with oil extracted from 10 vitamin E capsules and 5 vitamin A capsules. Massage with this mixture until all the mixture gets absorbed by the skin. Do stretch marks go away? Try egg white and you will know. Egg whites are rich in different types of proteins and amino acids, which can help in eliminating or at least fading the stretch marks. ● Use a brush to apply a thick layer of egg whites taken from two eggs and whisked with fork. ● After complete removal of egg whites apply some moisturizer so that the skin will not get dry. Lemon possesses astringent properties due to acidic juices. They are widely used in different face wash products for clearing skin and fading marks. ● Apply lemon juice with pulp directly over the affected area, leave to get absorbed completely. Wash with water. ● Mix equal quantities of orange juice and cucumber juice, apply over the marks, leave for some time and then wash with water. Alfalfa is a rich source of essential amino acids and different vitamins. It keeps the skin clear and healthy. ● Mix alfalfa (powder) with chamomile to form a paste. ● Apply this paste over the stretch marks and allow it to dry. ● Rinse with clear water and repeat this procedure daily until the marks fade away. Retinoid products are effective in lightening stretch marks and can help regenerate skin which helps in forming new layer of skin cells quickly so that the stretch marks fade away. These are available as over the counter creams. Apply the cream over the affected area. Hydroxyl acids effectively help in the skin healing process and in alleviation of skin scarring. The dose of glycolic acid is decided by the dermatologist according to skin type and intensity of stretch mark. The dose can be increased if effective results are not achieved. Vitamin C helps in improving the healing process of the skin. Apply topical vitamin C creams available in the market. It can also be taken in the form of oral dosage form and take 500 mg of vitamin C daily. Exfoliation is the removal of dead cells from the skin surface. Once these dead cells are removed, the surface is replaced by new healthy cells. Exfoliating creams and exfoliating loofah are available in the market. Moisturizers help in improving the flexibility of the skin so that the stretch marks starts to go away quickly. ● Moisturizers containing shea butter and cocoa butter must be used for application over the marks. It is a professional cosmetic procedure which helps in replacing the collagen of the body and mends the damages brought out by stretch marks. ● Vascular laser treatment: It helps is treating the inflammation of cells. Around 3-4 sessions are required for complete therapy. ● Fractioned laser treatment: It penetrates in different layers of skin and helps in making the cells smooth. This procedure is expensive and requires 3 sessions. It is one of complicated but most successful types of cosmetic treatment for stretch mark removal. Progressive results are obtained within weeks of treatment. The dermatologist will test the skin type and then use a tool to remove the upper most layers of cells. The skin remains irritated for some period of time, but new cells will replace the damaged layer of cells and remove the stretched marks.